Momfessionals: Teacher Tuesday - Exams are Coming Edition! Teacher Tuesday - Exams are Coming Edition! There is a LOT going on at the end of the year including lots of tests and exams for my classes and so I thought I'd share a couple of review games I like to use to keep things fun and still productive. I haven't played Four Corners with my classes in a LONG time... but I'm planning on bringing it back for this Spring's exam review days. This game is awesome because it gets the kids moving and you can use it for any age, grade and subject! - Create four large posters and label them A, B, C and D. Post one sign in each corner of your classroom. I have a "class set" of these that I made a while ago so I didn't have to continue to make the cards and posters every time we wanted to play. If you want a copy of my cards you can click HERE to download the PDF and then just print it front and back. - Prepare your multiple choice questions. I usually make at least 10, but it depends on what we're studying/working on. 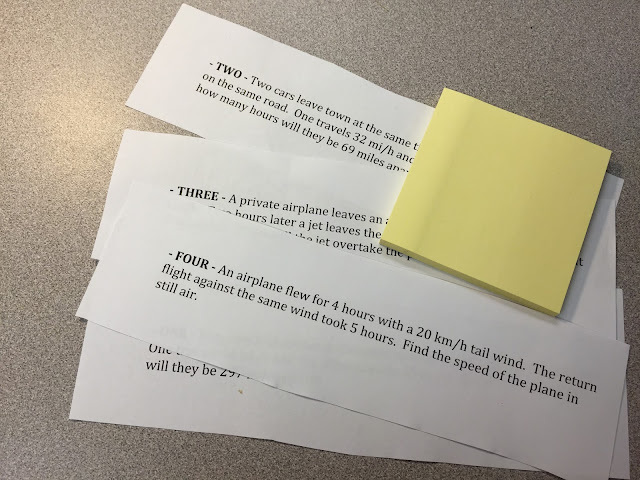 The questions need to have four possible answers labeled A, B, C and D.
To begin the game, give each student an index card face down on their desk. Instruct students to look at their cards secretly to find out if their role in the game is that of a Player or a Fibber. Tell students to not reveal their roles to their classmates... because it's WAY more fun if nobody knows! I like to run through a couple of practice questions before beginning the game. Gather students in the middle of the room and show the first question and four possible answers. Ask students which response they think is the correct one. Have students who think the correct answer is A stand by the A sign. Students who think the correct answer is B, C, or D gather near their respective signs. Here's the catch! 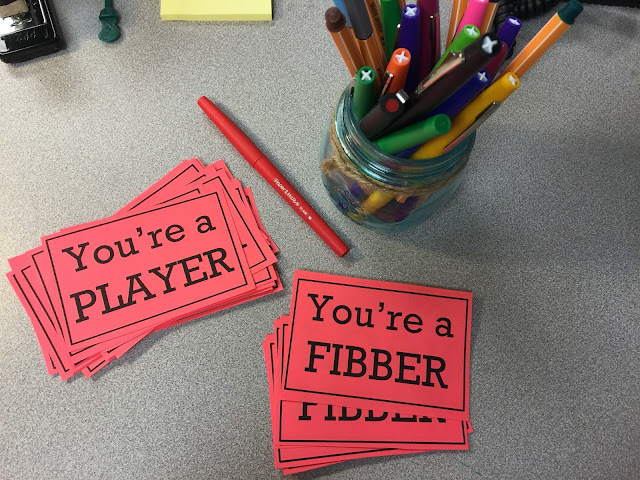 Students who hold the Player cards go to their appropriate corners while students who hold the Fibber cards are free to go to any corner. The Fibber's movements are intended to throw off the other students. Perhaps some of the brightest students are Fibbers and some players will be tempted to follow those students to the wrong corners. Doing this encourages students to think for themselves, not just follow the crowd. 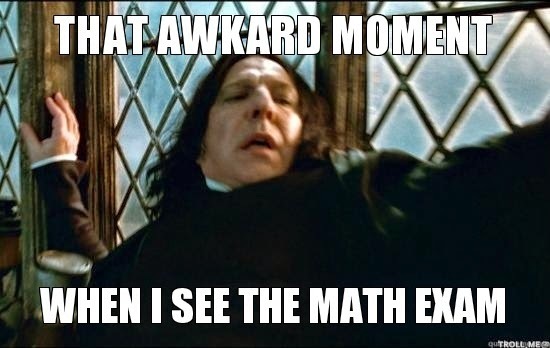 When all students have taken their corners, reveal the correct answer to the question. Ask students who chose the correct answer to explain why they selected that answer. Then you're ready to pose the next question. If students seem to be catching on to who the fibbers are then pass out the cards again and reassign roles. 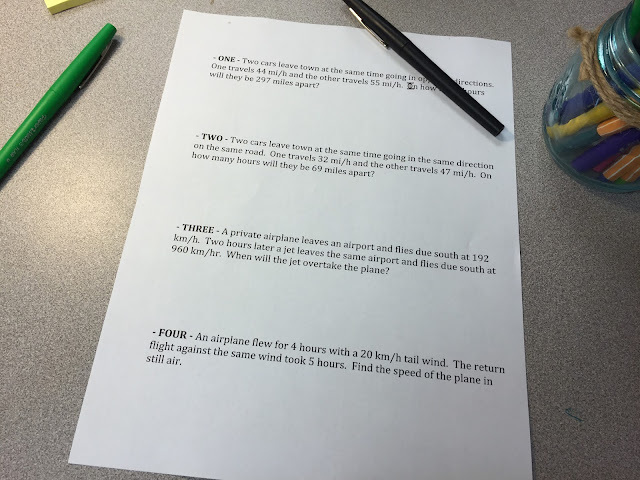 - Create a worksheet with four questions on it (I like to use use word problems). The questions need to be CLEARLY numbered 1 through 4. - Split your white board into four sections and label them 1, 2, 3 and 4. - Each student should have one piece of scratch paper and one question on their desk. - Set a timer (I use my SmartBoard timer) and give them a designated amount of time to work out the question on their scratch paper. They are NOT collaborating with each other at this point - it should be silent. - When the timer goes off, have them pass their question clockwise and then restart the timer so each group member is now working on a different question. The solving and passing continues until all students have answered all four questions. - Then each group attaches their sticky note to the board in the section numbered 1. - They'll continue this activity, coming to an agreement about the answers to the other questions and making their answers official to each question by placing the post-it on the board next to the question number. - When all groups have posted their answers to all four questions, check the answers and assign a group grade. Discuss any errors to be sure everyone understands the correct response. If you can't split your class into groups of four, you could easily do groups of three with three questions (or keep the four questions and have them rotate to an "imaginary person"). I like this activity because of the independent work and then collaborative effort. Depending on the material, I'll usually do about 3 minutes per question and then about 5 minutes to come to a consensus and post their answers on the board. If we have a lot to review sometimes I'll shuffle them into different groups of four and then repeat the process with four new questions. and you can read about one of the coolest ways to review HERE. 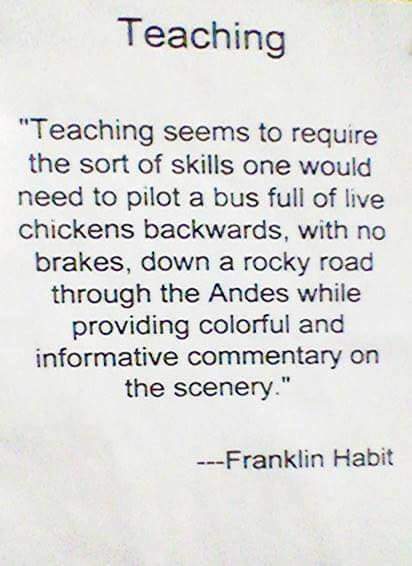 You always have the best ideas when it comes to teaching. You make me want to go back to middle school math ;). The end is near, Teacher Friends!! You can do it! You can do it! :) That player/fibber/four corners game sounds like a great way to review! I love playing Four Corners with my students!!! I've never added in a player and a fibber, but I will this year. Thanks for the idea! It's a fun twist and encourages everyone to really think for themselves! I love these ideas!! What a great resource for all of the teachers! I love the end of the school year but hate all the stress my kiddos feel with all those end of year tests!!!! Remind them that if they've been preparing well all year long they'll be fine! Yes this is all awesome review. I'm so happy I've come across your blog, such a great read. I also teach middle school math and cannot wait to play some of these games with my kids!! YAY! Glad you found a resource to use! I haven't! Looking into it today! I LOVE your Teacher Tuesday posts :) I recently accepted my first teaching job as high school math teacher, and can't wait to give these ideas a try! We homeschool and I teach the 1-6th graders at our church so I love these ideas for review games. I bet your students pray that they get Mrs.McAnally for math!;). Love this! I'm going to adapt these ideas for my 2nd graders. Every time you post something about teaching I wish my boys could be in your class. AMAZING!!! Here's to lots of coffee, some enthusiastic students and weeks that go by without a hitch until the end. You make me miss teaching! Ah, Four Corners! I had forgotten all about that game! It used to be one of my favorites in grade school. We would always play it on rainy days when we couldn't go to recess.